Imagine directing the most anticipated movie of all-time. Now imagine directing two of them back to back. That was the challenge facing Avengers: Infinity War (and Avengers 4) directors the Russo Brothers. Most of 2017 was filled up with the dynamic duo shooting at various locations around the world from Edinburgh, Scotland to Atlanta, Georgia – but which film was the most difficult to make? Yup, you read that correctly. 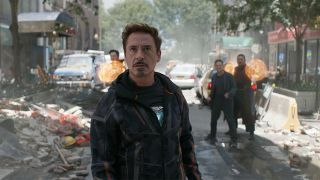 Post-production on Infinity War was done at the same time as shooting scenes for Avengers 4. I can’t even listen to music while writing, so how they managed to pull off two of the most logistically-intense productions ever back-to-back is a mystery to me. “We were really doing double duty while we were making that movie,” casually confirms Joe Russo in a humble tone that suggests he had to work late one night at the office, not edit and put the finishing touches on Avengers: Infinity War at the same time as directing its follow-up. With press tours and the like, the Russo Brothers haven’t had a (well-deserved) rest for over two years, and probably won’t until Avengers 4 hits in 2019. Even Thanos doesn’t work that hard – and he’s trying to kill half the universe. While you’re waiting for the Russos to hurry up (kidding! ), what better time than to take in everything else the MCU has had to offer with our list of the best Marvel movies.